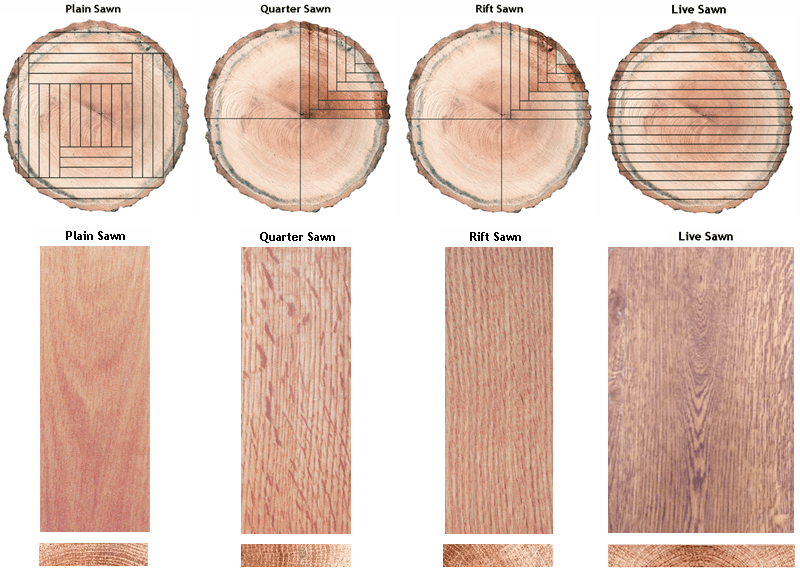 To fully understand the differing patterns of wood grain, it’s important to compare various sawing methods. The way the log is cut is what creates differences between grains. There are four cuts commonly used for flooring: plain sawn, quarter sawn, rift sawn and live sawn. Schenck & Company has extensive experience creating floors with each of these cuts. prominent, at a zero- to 35-degree angle. Quarter sawn gets its name from the fact the log is cut into quarters. This cut features annual growth rings at a 60- to 90-degree angle. This creates a visually appealing, somewhat tight vertical grain pattern, often with dramatic flecking. Rift sawn produces a unique linear or vertical grain pattern with no flecking. The annual growth rings are typically between 30 and 60 degrees. Rift and quarter-sawn flooring are aesthetically more appealing than other cuts, due to the minimal grain activity. The flooring is also more dimensionally stable. Live sawn starts with a straight cut through the log, which provides a full range of the wood’s natural characteristics. The grain pattern varies, with vertical grain on the edges. This result is a naturally beautiful floor. The wider the plank, the more uniquely beautiful the grain. This video from Frank Miller Lumber Company, Inc. provides a more detailed explanation of the process.